As with most things in life, there are right and wrong ways to get things done. Rubbing a puppy’s nose in a mess is NOT the right way to housetrain. Using ample amounts of supervision and positive reinforcement is. Use the following puppy house training tips to get started on the road to proper puppy potty training. The first course of action in housetraining is to promote the desired behavior. * Designate a potty area outdoors. * Guide your French bulldog there to do his business & say “go potty”. * Heartily praise him when he goes. 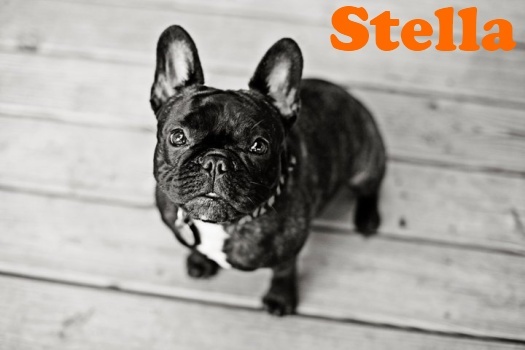 By occasionally giving him a treat right after your French bulldog finishes, you can encourage him to potty in the desired area. The odor left from previous visits to that area will quickly mark it as the place for the pup to do his business. Be patient, Accidents are going to happen. If you scold your puppy when they have an accident they will want to eat their poo to please you and not have you angry with them. If one of our Frenchies has an accident we say “NO, NO” and remove them from the room so that they can’t see us clean up the mess. Once the mess is clean they can come in again. If they see you clean up they may continue to make messes as this makes then think they are the alpha in the family and you don’t want that. To avoid spending a lot of time waiting for your puppy to go, you may want to teach him to potty on command. Each time he is in the act of eliminating, simply repeat a unique command, we use “go potty”, in an upbeat tone of voice. After a few weeks of training, you’ll notice that when you say the command your puppy will begin pre-potty sniffing, circling and then potty shortly after you give the command. Be sure to praise him for his accomplishments. 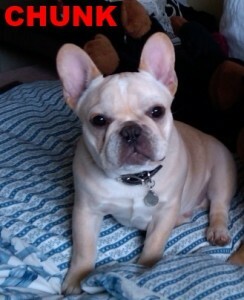 Like all dogs French bulldogs LOVE Praise, We say “Good job” if they go potty outside! We will also give a small (fingernail size) pup peroni doggie treat BUT only if they go potty and not other time do we give treats until our puppies are completely house broken. Most puppies will potty within an hour after eating. 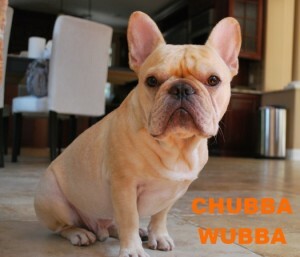 Once you set your French bulldogs’ feeding schedule, you will have some control over when he needs to go. Avoid giving your puppy a large meal just prior to confining him or he may have to go when you’re not around to take him out. Schedule feeding two to three times daily on a consistent schedule. We feed at 8 am, noon and 6 pm. Our adults get 1 & 1/2 to 2 cups a day depending on weight and activity level. With our puppies we have food available for only 30 to 40 minutes then remove it. Once your puppy walks away from their food bowl they are finished. The last feeding of the day should be done several hours before he’s confined for the night. By controlling the feeding schedule, exercise sessions, confinement periods and trips outdoors to the potty area, your French bulldog will quickly develop a reliable schedule for potting.